Texas Hunt Lodge offers a hunt package service which provides the finest Texas Native and Exotic Hunts found in Texas with Exquisite Texas themed accommodations at our 10,000 square foot Hunt Lodge located on the Guadalupe River between Ingram and Hunt, Texas. The Hunting product that we offer to our clients is Unparalleled, even for Africa Safari standards. We have over 70 species of wild game which we offer to hunters. From World Record scoring Red Stag, to Trophy Axis Deer, Trophy Fallow Deer, Ibex, Big Texas Whitetail, and Aoudad Sheep, we have the Wild Game Hunt that you want. All hunts with Texas Hunt Lodge are fully guided and we hunt these game animals by way of spot and stalk, safari style or still hunting...most of the time, it's your choice! 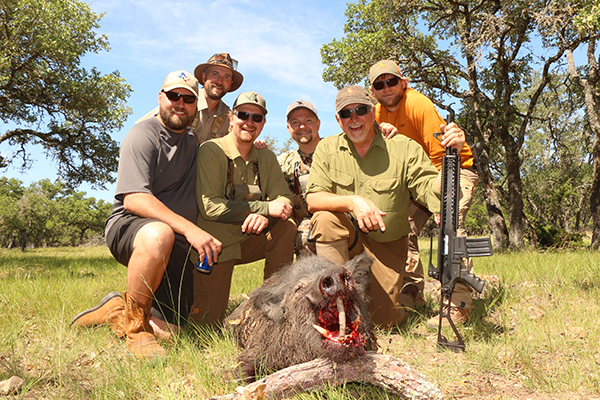 The hunts are fair-chase on our network of large ranches in the Texas Hill Country. All Methods of Hunting are available: Rifle, Bow, Handgun or Black powder is welcomed. Our Hunt packages leave nothing to be desired...in addition to the accommodations provided at Texas Hunt Lodge, we provide all meals from Exotic Game Entrees to Mexican Food, transportation while on your hunting trip with us, opportunities for clients to swim, fish, or just relax by the Guadalupe River, and much, much more. When not on the ranches hunting, clients will enjoy our 2000 sq. ft. fully-stocked bar, 70 inch LCD Flat Screen TV, Texas-sized meals, and comfortable Bed and Breakfast sleeping accommodations, all within walking distance from the Guadalupe River. Our Hunts are GUARANTEED...if we don't put you on the game animal that you've booked, then you do not pay the trophy fee (only daily rate) from your Hunt Package price. The majority of our hunting packages are 2-3 nights at the Texas Hunt Lodge, and 2-4 trips out in the field to search for and harvest your game animal...custom hunt packages for multiple wild game animals are available upon request and discounts will apply. Custom Trips to Leakey (Frio River), the Alamo, Fredericksburg, etc.